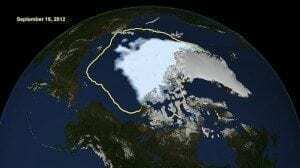 It is true that on September 16, 2012 the world reached a new low: The National Snow and Ice Data Center (NSIDC) reported that the extent of sea ice across the Arctic was at its lowest since satellite record-keeping began in 1979. On that date the sea ice reached its summer minimum, 1.32 million square miles, half of what the average size of summer ice was between 1979 and 2000, and almost 20 percent lower than the previous record minimum of 1.61 million square miles set on Sept. 18, 2007. NSIDC added that, despite especially warm conditions in 2007 being much more favorable for sea ice loss than this year, the thinning of sea ice due to climate change has made the ice more vulnerable to breakup and melting. Meanwhile, researchers with the European Space Agency’s CryoSat-2 probe reported in August that beyond the loss of sea-ice extent, the thickness and volume of the ice has also been declining significantly faster than expected. They found just 1,679 cubic miles this past summer as compared to 3,118 cubic miles in the summer of 2004. They anticipate that the Arctic could be ice-free in the summer for a day or more by the end of the decade. The implications of such melting are potentially immense. For starters, wildlife like polar bears, seals and walruses depend on sea ice for their survival; their habitat is literally being pulled out from under them. Polar bears were added to the federal Endangered Species List in 2008 for this very reason in what environmentalists herald as a great victory in that the federal government officially recognized the existence of global warming and would therefore be able to take more decisive action to rein in carbon pollution—of course, that part of the dream has yet to be realized. Perhaps even more alarming is the fact that melting sea ice and accelerating Arctic warming spur changes in the jet stream that increase the frequency of weather extremes like droughts, floods, heat waves and cold spells in the mid-latitude regions of the Northern Hemisphere. The fact that 2012 has been a scorcher all around—July was the hottest month on record, with two-thirds of the U.S. in drought, wildfires running rampant and half the counties in the country designated as federal disaster areas—only makes the connection between carbon pollution and the greenhouse effect all the more apparent.